This month's Recipes to Rival challenge came from Lauren of Fried Pickles and Ice Cream. She wanted us to have a taste of Italy by making Brucshetta and Lemoncello. 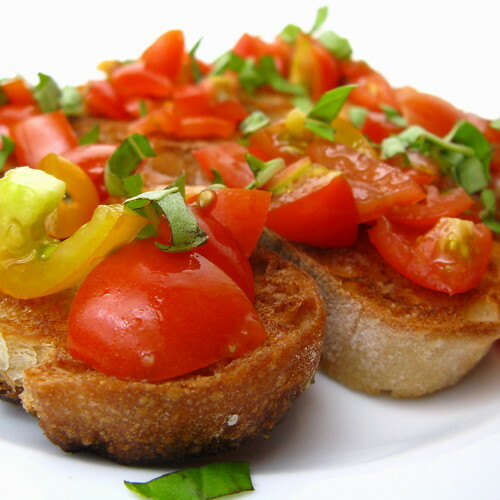 Bruschetta is a really simple yet flavorful appetizer, especially when you use fresh seasonal ingredients. I waited until we got the first tomatoes of the season from both our CSA & garden before making it which meant I used cherry tomatoes instead of the called for romas. I cut a petite baguette into slices, brushed them with olive oil & then browned both sides under the broiler (the recipe called for grilling the bread). Then I rubbed each slice of bread with raw garlic. The bread is them topped with chopped tomatoes. Matt mixed our tomatoes with a little of the 10 year old balsamic vinegar we picked up at Zingerman's this spring. Finally, the bruschetta was sprinkled with a chiffonade of fresh basil from our garden. A perfect afternoon snack. Limoncello is a sweet lemony liqueur from Southern Italy. It doesn't take a ton of ingredients to make just a little patience to let it sit. The recipe called for grain alcohol but my liquor store was sold out. Surprisingly one of the employees there knew a lot about making limoncello & suggest using vodka instead letting it sit a little longer. Mine is still at the sitting stage, yes I started it too late. When its done I plan on using it to make a sorbet. -Peel away zest from lemon leaving as little pith (the white stiff) as possible. -Pour alcohol over peels and place container in a cool place. -Leave the mixture for 7 days. -Every day give the container a little swirl. You will see the alcohol become darker and darker every day. -Prepare the simple syrup. Bring the water to a boil and add the sugar to dissolve. -Mix the syrup with the alcohol. BE CAREFUL... DO NOT DO THIS NEAR A FLAME!!! 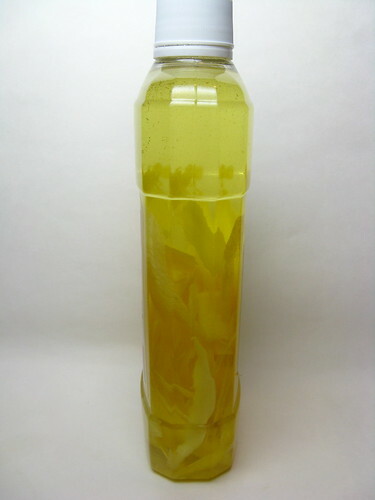 -Pour the limoncello into bottles or containers. Let cool completely. Store in the freezer until ready to serve! *Date your limoncello. After a year it will no longer be delicious. Your bruschetta looks delicious! I bet the limoncello will be very good in a sorbet! Beautiful photos! I haven't tasted my limoncello, either, but I like your idea of making sorbet with it. I have a batch of Limoncello I just made too. I used Giada's recipe on Food Network. It came out great. I have been serving it with club soda. I've been wanting to make limoncello for ages - thanks for the motivation - it looks great. Oh wow, limoncello sorbet. SOunds wonderful. I am very late here putting up my post. I love your bruschetta pictures! everything looks great, I love the how colorful your bruschetta is! The brushetta really does show off those wonderful fresh tastes. For me, pouring limoncello over vanilla icecream works better than sorbet (I get the balance wrong and there is too much alcohol so it doesn't freeze). The 10 year old balsamic vinegar addition to your bruschetta is making my mouth water. YUM!